In case you were too busy making your Taylor Swift playlists on Spotify, you should know that the U.K.’s citizens have just voted their next set of Parliament members. Why did May call for snap elections anyway? Back in mid-April, Prime Minister Theresa May called for a snap election despite her promises to wait for the May 2020 scheduled elections. The plan was to capitalize on her (and her party’s) popularity and strengthen their numbers ahead of the crucial Brexit negotiations. Back then the Conservative Party held 330 seats, just a smidge above the 326 required to form a majority in the 650 seats of the Lower House. The Labour Party came in second (229 seats), followed by the Scottish National Party (54) and the Liberal Democrats (9). The pound rallied at her announcement as market players and their cats had bet on a landslide win for the Tories, with polls attributing double-digit leads against the next party. Did May’s gamble pay off? Not even a little bit. In the weeks that followed, May’s hard stance on Brexit, two terror attacks in the U.K., a few REALLY unpopular bits in the Conservative Party manifesto, and hard campaigning from her opponents have pulled the Tories’ lead down to uncomfortable levels. Fast forward to Election Day and now May’s party has…more regrets than seats in the Parliament. With a voter turnout of 68.7% – the highest since 1997 – and only one more constituency left undeclared, Theresa May’s Conservative Party is expected to snag 318 seats in the Parliament, 12 fewer than when she called for the elections. The Labour Party is expected to get 261 seats (+31 seats) while the Liberal Democrats (12) and Democratic Unionist Party (10) also added to their numbers. The Scottish National Party (35) also lost seats, though. In a word, trouble. With no party reaching parliamentary majority, the U.K. officially has a “hung Parliament.” And no, it has nothing to do with William Hung. Basically, having a hung Parliament means that it will be harder for the MPs to reach decisions. But as leader of the party with the most seats, May will be given a choice if she wants to (a) form a coalition or (b) run a minority government. Forming a coalition means teaming up Survival-style to get the required 326 votes. In this scenario the Tories would sign a formal coalition as PM David Cameron did with the Liberal Democrats in 2010. The Tories would have to give up control, though, and likely give Cabinet positions to the other party. Or they could choose to run a minority government and enter into “confidence and supply” agreements, wherein a small party or independent MPs will “supply” their votes on bills and “confidence” votes in exchange for progress for their pet causes. What does this mean for Brexit negotiations? But with the Conservative Party not even getting majority, things just got a lot harder for May. Not only does she have to soften some of her stances (not all Tories are in favor of a hard Brexit), but she might have to scrap some of her plans altogether. Recall that Britain has already officially triggered Article 50 of the Lisbon Treaty. This means that they have two years to negotiate their way out of the EU. Tick tock. As you can see on the chart above, Nicola Sturgeon’s Scottish National Party also lost bigly. More importantly, Alex Salmond – Sturgeon’s deputy, mentor, and a key SNP member, has lost his seat in Gordon. This means that we won’t see a second Scottish referendum anytime soon. Already Sturgeon has shared that she would “properly think” about whether to press ahead with Referendum 2.0 after the Tories enjoyed their best performance in Scotland since 1983. Nick Clegg, THE leader of the Lib Dems in 2010 and former Deputy Prime Minister, also lost his seat in Sheffield Hallam to Jared O’Hara of the Labour party. Yikes! The pound took its hardest hit when exit polls – which have been good predictors of actual results – pointed to a hung parliament. The currency also dropped by its sharpest since the EU referendum and made new lows while the final tallies were shaping up. 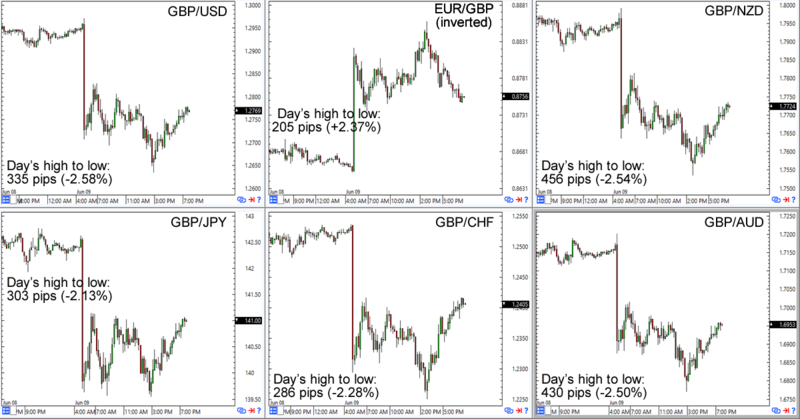 However, it also saw retracements at the start of the London session. FTSE 100, which includes companies that would profit from a weaker pound, opened higher today. Meanwhile, FTSE 250, which has more local companies, are marginally lower on the day. It’s also interesting to note that utilities companies are among the biggest winners today. One possible reason is that the lack of majority would mean that the Labour Party won’t likely push through with nationalizing them while Theresa May can’t cap their bills either. PM May revealed that she has seen the Queen and has formally asked permission to form a government. Apparently, she’s now teaming up with the Democratic Unionist Party (DUP) to form a coalition in time for the start of Brexit negotiations AND the opening of the new Parliament in 10 days. This means that, unless May convinces Foster and her gang to come over to the “hard” side, then we’ll likely see a toned down version of May’s initial Brexit plans. Read May’s full statement HERE.